This Spicy granola with Sriracha Millet Quinoa is a very addictive savory, sweet and spicy granola with puffed millet, quinoa, peanuts, cranberries and orange zest! Savory granola. Vegan Gluten-free Recipe. If you like anything in Orange sauce, asian flavors and spicy, this is the granola for you. With orange zest, Sriracha, soy sauce, sesame oil, sweet and sour cranberries and peanuts, there is a burst of flavor in each bite. 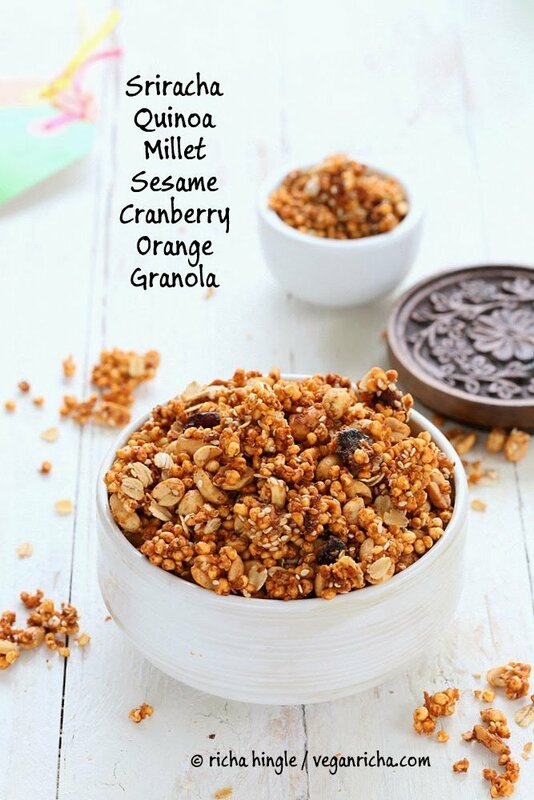 A Sweet and Sour Orange Spicy Granola that is highly addictive! This recipe uses limited oil and limited sweet/sugar, this is is also one my favorite ways to finish up a bottle in one sitting. We all know that savory rules in this house. Hubbs is notorious in eating up cups full of roasted nuts when he is at home(he forgets to eat anything at work. From experience I now know, that everyone else around his office finishes up things for him :P). But just nuts in that quantity are not the best snack option. So I like to add some lighter, healthier ingredients like puffed grains, oats etc to his roasted savory trail mix bowl. 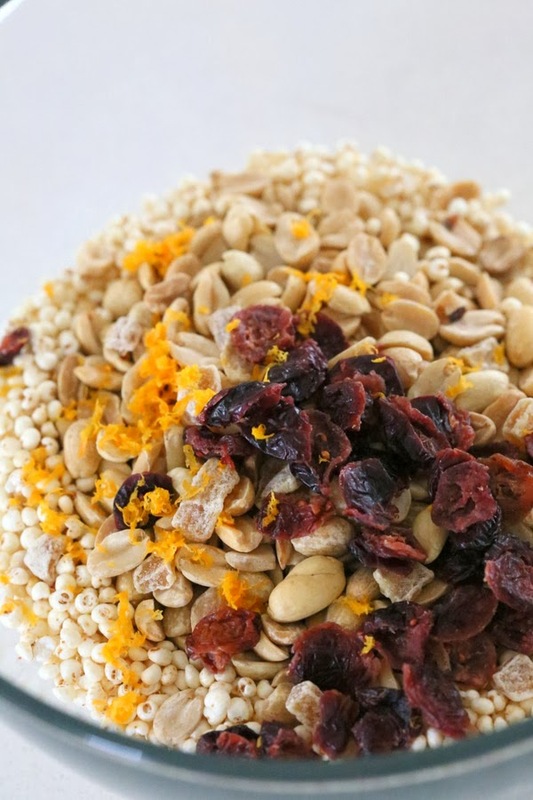 The granola has Puffed Quinoa, puffed millet (arrow head mills puffed grains), Oats and peanuts, sprinkled in with candied ginger and cranberries, some coconut and sesame seeds. Use any puffed grains of choice. The maple, Sriracha, almond butter bind the granola and the zest and sesame oil help take it to an amazing level. Kapow! You can also make this without the Sriracha. Add a Tbsp more nut butter and a tsp of vinegar to have enough wet and a sweet and sour Orange granola. Yes, open that jar, take a whiff, and try a handful! Heat up the wet ingredients and boil for a few minutes. Add almond butter and Sesame oil and mix to a smooth consistency. In a bowl, add all the dry ingredients. Give them a mix. Add the wet to dry. Mix well. Spread on baking sheet. Bake at 325 degrees F for 20-25 minutes. Move the granola around a few times. Let cool completely. It keeps getting crunchier as it cools. 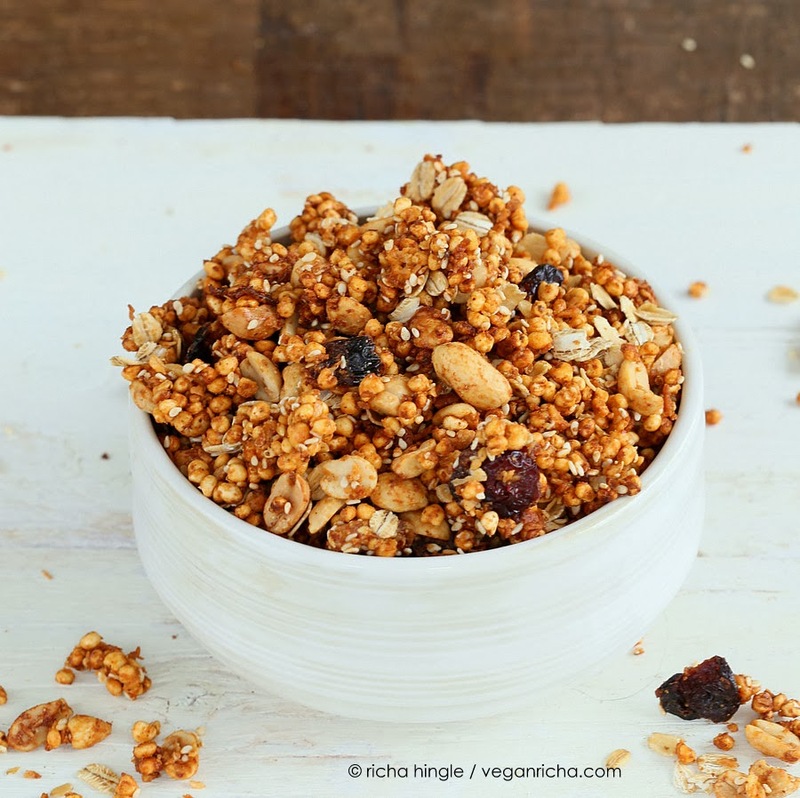 This Spicy granola with Sriracha Millet Quinoa is a very addictive savory, sweet and spicy granola with puffed millet, quinoa, peanuts, cranberries and orange zest! Savory granola. 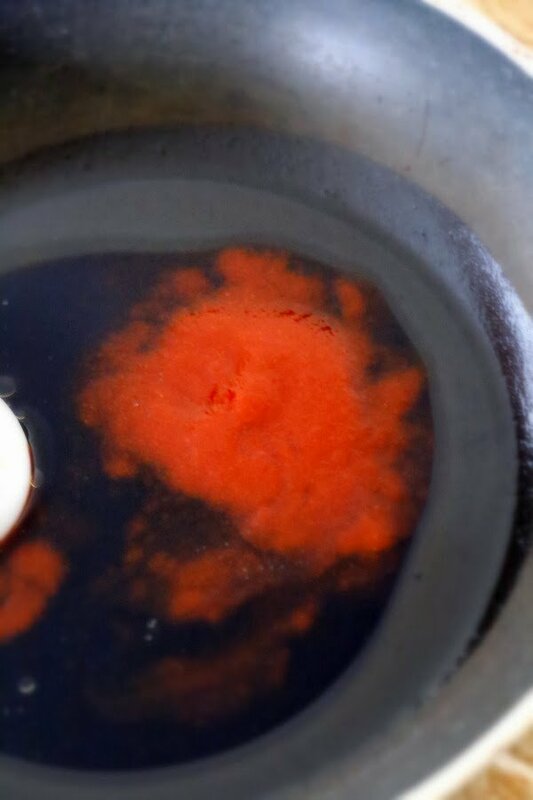 In a pan, add oil, sriracha, soy sauce, maple syrup, sugar and salt and bring to a boil on medium heat. Boil for 2-3 minutes at low-medium heat. Take off heat and mix in the almond butter, sesame oil and zest. Mix to a smooth consistency. In another bowl, add all the dry ingredients and mix to distribute evenly. Mix the wet into the dry and combine well. , other brands might have fish or animal ingredients in the sauce. Oooh I make granola ll the time as a breakfast treat, but this looks like a great tea time snack. Sriracha, yum. This looks so amazing and what a nice gift for friends. Super intriguing. I will be making this. I love to snack on roasted nuts, too! I have never had a svoury granola. 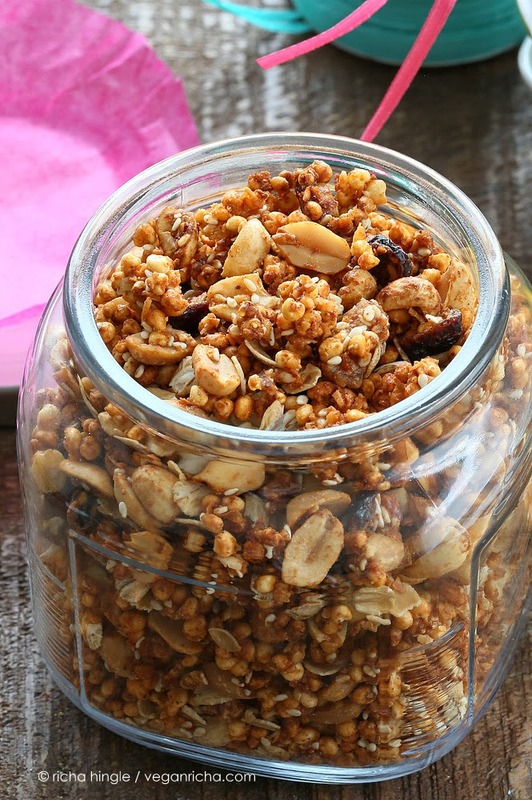 What a great alternative to a boring trail mix! This sounds crazy awesome! Such a weird mix but Im intrigued! i love the flavors in here! so innovative! and the quinoa and millet are an awesome change, too! I think your blog is absolutely amazing! LOVE it! I’m your newest follower! What a great combination of flavors. I often want something like granola but it can be a bit, well, boring. Not this! So pretty! Homemade Granola is on my list of homemade gifts this year, I love the sweet and spicy combo- a fun alternative to the standard sweet granola! 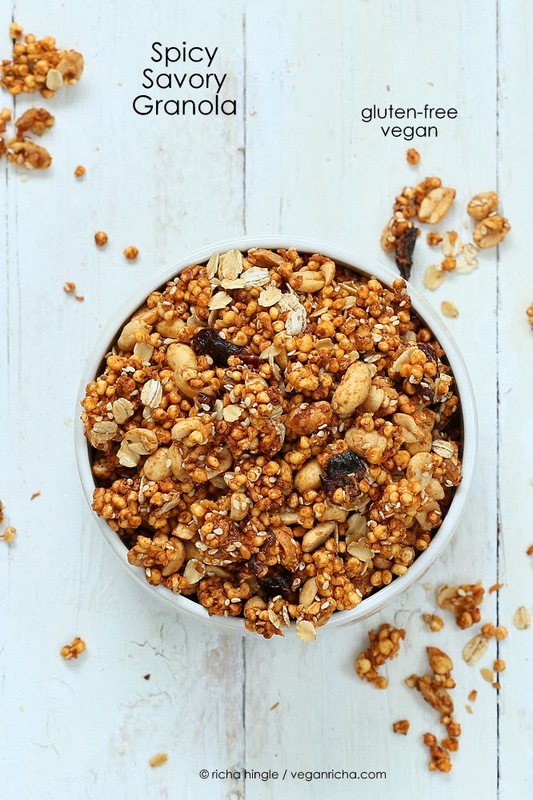 There are so many things going on in this granola! 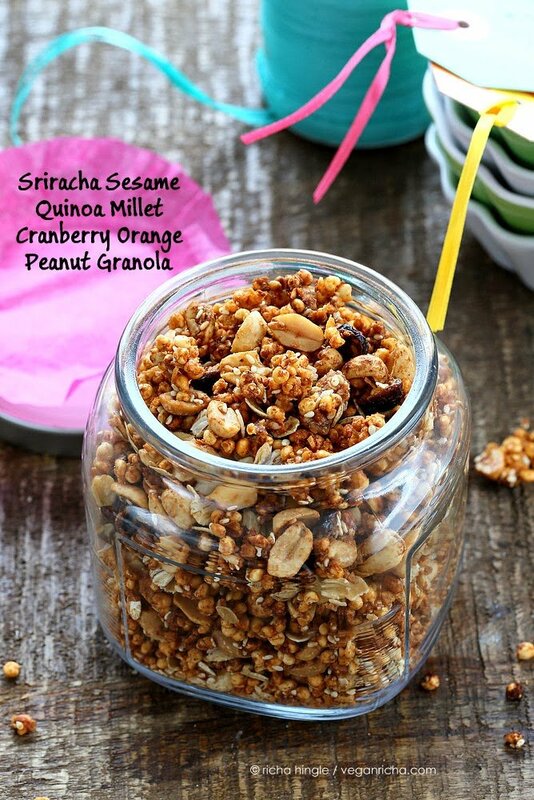 Such a great blend of grains and sriracha! I was wondering if someone could clarify the Sriracha ingredient for me. I almost used it for a recipe and noticed that it has fish extract in it. Being a vegan, I didn’t use it. Is it just my brand that I bought and if so, what brand is vegan? This recipe is not gluten free if you are using “old fashioned” ordinary oats, they must be gluten free oats. Although oats are naturally gluten free the way they are processed contaminates them and they are no longer gluten free. So do not use them if you intend to make this recipe for someone who suffers from coeliac disease or someone who is avoiding wheat. Thanks! yes, that would be an awesome addictive mix! Richa, I just made this. It’s my first experience with Siracha so I wimped out and only used1tbs plus 1tbs orange juice. I had no peanuts so used pepitas and pecans. This granola is out of this world. I would never think to put sweet and savoury together for breakfast. The flavours are incredible . Thanks for a great recipe. I know right! I think not many people try it for the spicy savory flavor profile, but it is so good. 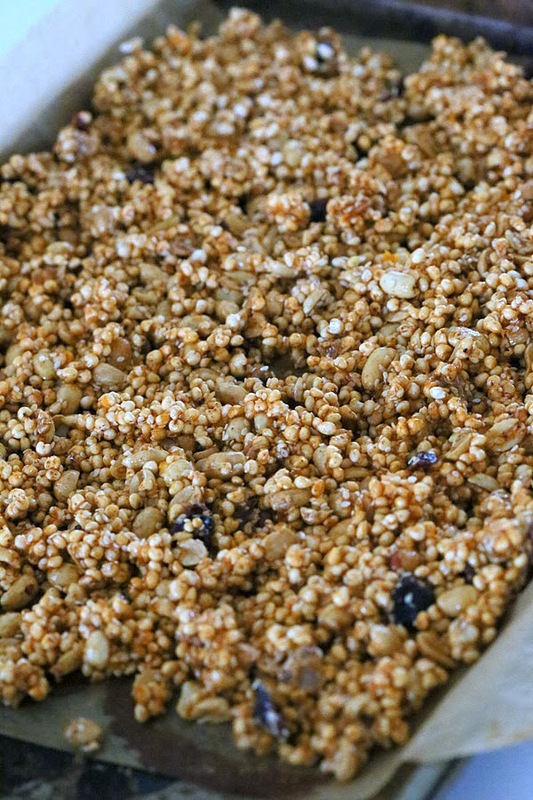 you can pop the millet or quinoa in a skillet over high heat. It burns easily though. gracias por responder!! saludos desde argentina! !muy contenta de conocer tu visión de la cocina indu y con fusion americana , bien sin embargo probé hacer pop de mijo y se me quemaron la mayoría, logro tostarla pero no pop, voy a probar otra vez con una sarten de base mas gruesa, y seguiré probando hasta que lo tenga!! muchas gracias otra vez!!! Do you know what company makes the puffed quinoa? I’m having a hard time finding it. This sounds amazing!! You an also use other puffed cereal such as millet, rice, wheat etc. Richa, is it ok to prepare the jars like 10 days before they will be gifted? Will the granola be ok or it wont last that long? The recipe looks amazing, I’m making it for my sister and mother in low. Thanks a lot! i would suggest preparing them just a few days in advance and storing in airtight glass jars. Your sis and mom will be storing it for sometime before finishing too, so you want it to retain freshness. It stays crisp, but the sauces might start adding a stale note after 10 days(depending on the brand and ingredients).